After yesterday’s Downhill, it’s time for the Slalom to round off the 77th Hahnenkann-Races. Exactly 50 years ago today and at precisely the same time, the racers started the first run at 10:30 am. Jean-Claude Killy celebrated a great victory. Not only did the French athlete win Kitzbühel‘s first World-Cup Downhill in 02:11,92, he also triumphed in the first World-Cup Slalom at the foot of the Hahnenkamm. 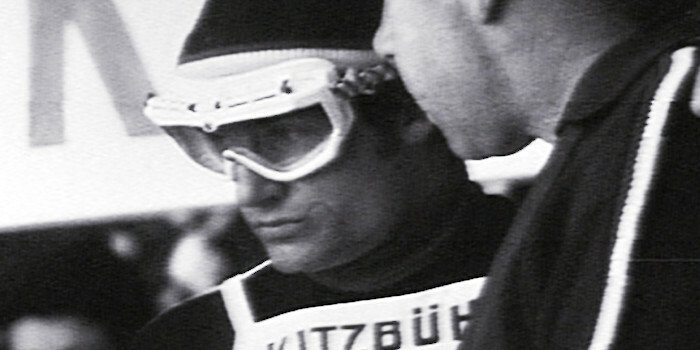 In fact, Jean-Claude Killy had secured the Combined victory after the Downhill alone. However, instead of staying on the safe side for the Slalom, he decided on a high-risk run and verily danced through the Slalom course. Once again, he had the best time in the first as well as the second run. Killy’s most dangerous opponent, Bengt-Erik Grahn from Sweden, was left behind – no less than 2 seconds slower. And so the French athlete was the only one to achieve the dream score 0 in the Alpine Combined. Since then, no racer has ever succeeded in winning the Downhill as well as the Slalom.